Make time today to smile at even the smallest things. 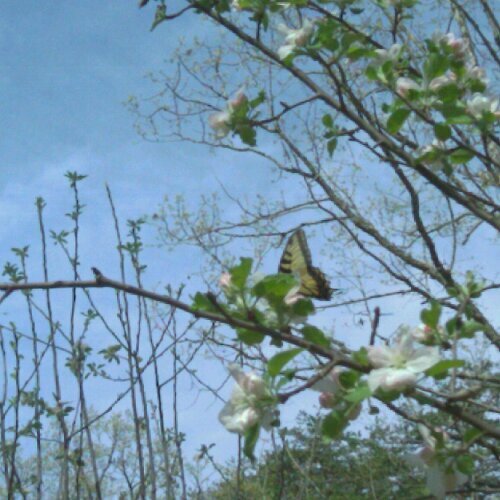 This entry was posted in friday soother and tagged Apple tree, butterfly, friday soother, happiness on April 30, 2010 by LHale. I received the following via email this morning. Passing it along. If you would do the same, I know Dr. Gina Wong-Wylie would be deeply appreciative. Thank you! Close to half of women under the age of 19 years who become young mothers are estimated to develop Postpartum Depression (PPD). Researchers with the Centre for Disease Control have indeed confirmed that young mothers are at an elevated risk for developing PPD. Nevertheless, the experience of depression for young moms does not necessitate negative long-term consequence and lifelong disadvantage. In this study, the researcher explores experiences of young moms who moved through PPD to a place of empowerment. And you are willing to speak about the experience of maternal depression as a young mother and share stories of growth from that experience and positive outcome for the purposes of research. This entry was posted in postpartum depression, research and tagged canada, depression, Dr. Gina Wong-Wylie, teen moms on April 29, 2010 by LHale. stopped glaring at mothers who choose to breastfeed in public? stopped glaring at mothers who choose to bottlefeed in public? stopped judging mothers who had cesarean sections? stopped judging mothers who gave birth vaginally? stopped judging mothers who had VBACS? stopped making mothers feel guilty for the choices we made in childbirth? stopped making mothers feel guilty and ashamed for struggling with a Postpartum Mood Disorder? stopped making mothers feel guilty for the choices we’re making in childcare? gave birth via cesarean section? make childbirth choices out of love and respect for their family’s chosen lifestyle? choose to seek help for our Postpartum Mood Disorder experiences in a way that also fits our lifestyle? make childcare choices out of love and respect for their family’s chosen lifestyle? This entry was posted in motherhood and tagged bottlefeeding, Breastfeeding, cesarean, guilt, motherhood, Postpartum Mood Disorder, vaginal birth, VBAC on April 28, 2010 by LHale. Just Talkin’ Tuesday 04.27.10: How much of your Postpartum story will you share with your kids? Six years ago when I became a mom for the first time, my mind was certainly not thinking about a Postpartum Mood Disorder. And I was certainly not thinking about having to discuss it with my newborn daughter when her sister and brother were born. Yet there I was – staring down delivery for the third time and the very real possibility of relapsing- and I had these two darling little girls depending on me. Suddenly it wasn’t about me anymore. It was about them. About their security, their safety, their happiness, the very stability of their world depended on how my husband and I explained the possibility of mommy experiencing a Postpartum Mood Disorder. We did not talk about it a lot when our second daughter was born. At least I don’t remember talking about it a lot. I may have mentioned something briefly but at that point, I hadn’t become an advocate or blogger. I had not educated myself as much as I had by the time my pregnancy with our son. I had not come to embrace the realization that Postpartum Mood Disorder affects the whole family. Once I embraced that fact, I realized there was no way I could avoid having a discussion with our daughters. I should also say that our oldest daughter really saw a lot of strife she shouldn’t have with that second episode of Postpartum. My husband and I would yell and scream at each other with her just in the other room. We were both frustrated, scared, and really not putting ourselves first at all. Postpartum will do that to you – completely consume you if you allow it to do so. Our communication had hopelessly broken down by the time our second daughter came home from the hospital. Somewhere in the second trimester of my third pregnancy, my husband and I began to talk with our daughters about Postpartum Mood Disorders. We did not use big clinical words even though we don’t believe in baby talking the kids. We told them that sometimes, after moms have babies, they get sad. And sometimes they get angry. But it’s not the mommy’s fault. Not the daddy’s fault, not the baby’s fault and not the big brother or big sister’s fault. That it just happens. And if it does happen, mom goes to a doctor to talk about what’s going on so she can get help and get better. Then we brainstormed ways they could help mommy if she got angry or sad after she had baby. That’s my girl – curing Postpartum Mood Disorders one tickle at a time! I’ve since talked with the girls about what I do and why I spend time on the computer and the phone. I remind them about how some mommies get angry or sad after having babies. And then I tell them that mommy makes herself available to these mommies so they don’t have to be sad or angry alone. I tell them that mommy helps these mommies find the help they need to get better so they can be happy with themselves and with their families. They both seem to understand very well what mommy does and appreciate it. Making the decision to share my postpartum journey with my kids was not easy. But given my history and the high chance of relapse, we felt we had to share with them what may happen after their brother was born. One day I may share with them this website and let them read everything that happened. I’ll answer any questions they may have. It’s important to me they understand that there is no shame in any kind of mental illness. But until they are much older, I don’t feel they need to know very much. I certainly don’t regret having shared with them what I have thus far. For me, sharing with my kids will be showing them that it is possible to get through the toughest parts of life. I sincerely hope the phrase “I give up” is never in their vocabulary. So let’s get to just talking. Will you ever share your Postpartum Story with your child? Have you already shared with your son or daughter? What did you tell them? Will you tell them the whole story or just bits and pieces? Why would you tell them your story? Why would you choose not to tell them if that’s your decision? This entry was posted in Just Talkin Tuesday, postpartum depression and tagged children, daughter, Postpartum Mood Disorder, son, stigma on April 27, 2010 by LHale. This Friday and Saturday there is a free two day conference in Flagstaff, AZ at Flagstaff Medical Center. The topic is Perinatal Mood Disorders: Assessment and Treatment. CEU’s and AMA PRA Category 1 credits are available. You can read more about this conference here, as well as access contact information for registration. Just an FYI in case anyone plans on coming up for it who isn’t already registered. I would definitely, definitely call before you travel there. I’ll be there and they were overwhelmed with the response. There’s a large waiting list right now, so they’re asking that if current attendees can’t make it, that they let the organizers know so they can start letting the wait listers in. Thanks for spreading the word! It’s going to be an amazing conference, and we’re hopeful that it’s going to mean big things for awareness, education, screening and treatment of PMD in Arizona. This entry was posted in Perinatal Event, postpartum depression and tagged CEU, conference, Flagstaff Medical Center, Postpartum Mood Disorders on April 27, 2010 by LHale. Six years ago today I began a journey at 1:15p.m. I had no idea where I was going. No clue regarding the difficulty of the tasks ahead. I could say it was the beginning of the fall. But I won’t. I don’t see it that way. Six years ago, not only did I give birth to my first child, I unknowingly gave birth to a new me. I gave birth to a strong new woman who was about to be tested in ways she never thought possible. Ways that allowed me to grow in directions I never thought possible. I’m thrilled to celebrate her birthday today. And truly the ultimate Survivor Mama Day for me. Because six years ago today is when the me today was born. And I am madly in love with both of us! 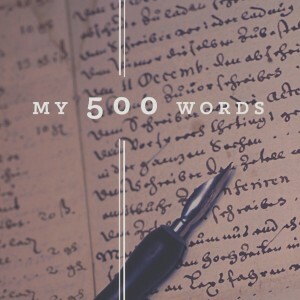 This entry was posted in postpartum depression and tagged birth, birthday, personal growth, postpartum depression, Survivor Mama Day on April 26, 2010 by LHale. 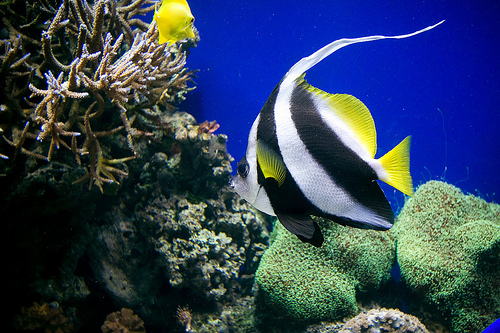 This entry was posted in friday soother and tagged Dory, Finding Nemo, Monterey CA, Montery Bay Aquarium, tropical fish on April 23, 2010 by LHale. Flattery will get you everywhere: I got a blogger Award! 3. 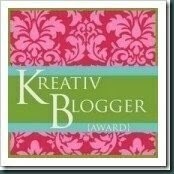 Pass the award on to seven blogs who you think embody the spirit of the Kreativ Blogger Award. Katherine at Postpartum Progress, Amber at Beyond Postpartum, Kristine at Cora’s Story, Weasel Momma at World of Weasels, Mama 2.0 @ NuckingFuts, MommyGeekology over at MommyGeekology, and Lisa at Our Happy Nut House. 4. Name seven things about yourself that others don’t know. 2. I love pistachio flavored anything. 3. I could probably eat my weight in bacon. And still want more. BACON! 4. I can’t read trashy romance novels. The atrocious grammar annoys me. 5. Dinnertime as a child was more often a lesson in sarcasm and wit than anything. 6. I’m a New Jersey Devils Fan. That’s right people. I.LOVE.HOCKEY. 7. I’m also a New Jersey York Giants fan. Even if they did destroy the stadium, the bastards. This entry was posted in postpartum depression and tagged Kreativ Blogger Award on April 22, 2010 by LHale. The Perinatal Mood Disorder Clinic at the University of Colorado Hospital has been established to help women with these difficulties. The Mood Disorder Clinic serves as an on-site resource for pregnancy and postpartum mood evaluation. Through the collaboration of Elizabeth Brass, MD, OB/Gyn, Erica Schwartz, CNM, DNP(c), director of the nurse midwifery program and Cheryl Chessick MD, a psychiatrist, from the Depression Center the mood disorder clinic has been established. This mixed complement of staffing allows for an integrated approach to diagnoses and treatment. Comprehensive screening for these disorders are conducted and the providers review the risks and benefits of treatment modalities during pregnancy and lactation. An avenue for ongoing community referrals has also been developed. This is great news for the women of Colorado and surrounding areas! This entry was posted in postpartum depression and tagged Colorado, Perinatal Mood Disorder Clinic, UCH on April 22, 2010 by LHale. Last night as I was traversing Publix during our weekly grocery trip, all three kids in tow, I managed to flip through a copy of YOU, Having a Baby by Dr. Michael Roizen, M.D., and Dr. Mehmet Oz, M.D. Yes, that’s the same Dr. Oz with the daily TV show. I picked it up and flipped to the index. Betcha can’t guess what I was checking for…. c’mon. Guess! Dr. Roizen and Dr. Mehmet? Thank you for addressing Postpartum Mood Disorders properly. Thank you for distinguishing between Baby Blues and Postpartum Depression. Thank you for acknowledging that if a woman even THINKS there’s a problem she should see her provider. THANK YOU for talking about scary thoughts. THANK YOU for writing so honestly and informatively about Postpartum Psychosis and not making moms who have PPP seem like hopeless cases. Because they’re not. I was very impressed indeed. I can only hope other pregnancy book authors will follow your lead and write so honestly and informatively about Postpartum Mood Disorders. Moms deserve nothing less. This entry was posted in Perinatal Mood Disorders, postpartum depression, postpartum psychosis, pregnancy, public awareness and tagged Dr. Michael Roizen, Dr. Oz, postpartum depression, Pregnancy Book, YOU Having a Baby on April 21, 2010 by LHale.